In this post I would like to start an online discussion about a very interesting recent PNAS paper: Tracking a complete voltage-sensor cycle with metal-ion bridges by Henrion et al. I know that other people in the voltage-gated cation channel field are very interested in this paper and it also relates to many of the topics I have been discussing in my posts. I thought it would be a good idea to discuss it and a journal club type format encourages contributions from anyone who is interested. So read the paper and join in the discussion! This paper, from the labs of Fredrick Elinder in Linköping University Sweden and Erik Lindahl in Stockholm University Sweden, defines 20 new interactions in the different conformations of the voltage-sensor domain (VSD) of the Shaker Kv channel. They measure these interactions by metal binding and stabilization of the different conformations in mutated channels. Using these newly defined interactions as constraints Henrion et al. then build Rosetta models of the different interactions using the open structure of the Kv1.2-2.1 paddle chimera (learn more about Rosetta at the Rosetta Commons website). You can download the PDBs for these models here. 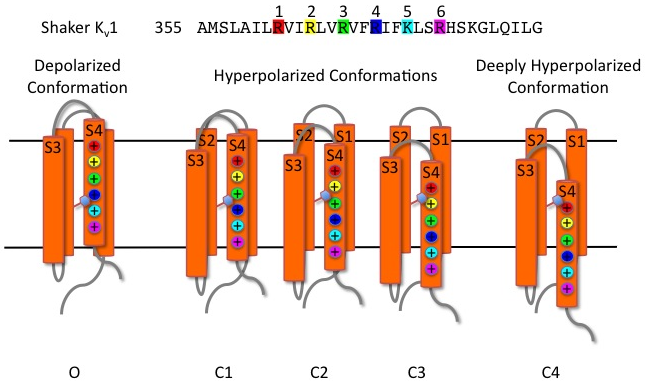 The models represent five different possible conformations of the Shaker Kv channel (O, C1, C2, C3 and C4). Fig.1 one is a cartoon schematic of these five conformations (adapted from my post on the omega current). Figure 1. Cartoons showing the different putative conformations of the Shaker Kv VSD. The sequence of the S4 transmembrane helix is shown at the top. The S4 arginines are color coded as in the cartoons. The model designations for the different conformations are show below each cartoon. This is a very complex paper with lots of data and conclusions. It will take lots of effort to analyze and critique in detail, so this discussion will probably last a while. I will briefly write about what I think and why but I am very interested in finding out what other people think as well. If you want me to expand on anything just join in the conversation. Please contribute your thoughts to the discussion. I will start by going figure by figure through the paper and the supplementary. There is a lot of data so this will take some time. If you want to skip ahead and start a discussion about any aspect of the paper, including the figures or the models please feel free. 2) If there isn’t a thread related to your question or comment start a new thread by posting a comment. The way this blog works is that I will have to approve each reply and comment before they are posted online. Therefore, there may be some delay between when you submit and when your comment appears. As time goes on I might add to the main text of this post as well. No haters. I will not post anything that is overly negative or rude. Of course, critical analysis is encouraged (this is science after all). If you think there is something wrong with the paper, please let us know. However, why you think something is wrong in the paper is more important and interesting. Also it is also ok to say you are skeptical about certain findings in the paper but, again, why you’re skeptical is the interesting part. If you are impressed by, or find a conclusion particularly interesting please share your thoughts. Really impressive amount of work by the authors. The number of mutants generated and characterized is staggering. Underlying assumptions in the paper should have been discussed more clearly. For example, that S3b doesn’t move and how they sorted the different bridging interactions into the conformational states. Fig.1 of Henrion et al. discusses the general approach of using metal-ion bridges to measure distance constraints in the VSD structure. Any questions or comments on Fig.1 please reply to this comment. That is a lot of mutations to test! The positive signs (+), as in the paper, indicate the locations of the S4 arginines. The rest of the mutations from the list above do not seem to from bridging interactions. Because we know that there are more than one closed state and that binding to any of the closed states should result in stabilization of the closed channel, it is difficult to say which metal-ion bridge forms during which state. The authors proposed the above grouping because of the periodic nature of the interactions. Each of the above groups of interactions are separated by a region of non-metal-ion bridge forming mutants (i.e. I325C/I360C, T326C/I360C & T326C/L361C don’t form metal ion bridges and separate the proposed C2 and C1 bridging groups). Are these reasonable criteria for breaking up the metal-ion bridges into the different states? Wouldn’t this periodicity between bridging and non-bridging mutations be expected simply from the helical nature of S4? Although the two S3 mutations (I325C and T326C) are next to each other is it still possible that their metal bridging interactions to span two different states (ie I325C/L358C forms a bridge in the C1 state while T326C/L358C forms a bridge in the C2 state)? The volume of work accomplished by the authors is commendable but I couldn’t help being put off by lack of consideration of the assumptions behind the conclusions. My first complaint (which is more of a pet peeve of mine) is the promiscuous use of the word “interaction” – I would’ve preferred the authors’ clearly mention that they identified several new state-dependent proximal sites (rather than interacting sites…one does not necessarily imply the other). My second point is related to the use of 10microM Cd2+. Cd-S has a dissociation constant of >10^(-25) in solution which is massive. Hence in Cd bridge assays one always runs the risk of introducing distortions in the structure (considering that Cd binding could provide sufficient energy for structure distortion). It is always crucial to measure/report the Cd2+ binding affinity (even an empirical estimate) of different bridging sites (since a distortion would consume energy the binding affinity of Cd would reduce, while truly proximal sites would simply just bind cadmium with very high affinity). Apart from one pair of sites (for which the binding affinity is high (Kd in nM range)) the authors do not mention this point for any other pair which makes me “feel not so good” about the paper. Also whether the Cd lock effect is reversible has not been demonstrated either except for a few of the pairs compelling the thought that in some of the pairwise bridged mutants, the effect was irreversible suggestive of a distortion. The estimate of the “strength of the interaction” was somehow attributed to the magnitude of the functional effect caused by Cd application – once again, I can’t understand why this would always be the case! My third point is: say I325C and L361C come close enough to be bridged by a Cd, implying Cgamma distances between the residues is max 5A. How can, in the unperturbed system, the bulky sidechains of Ile and Leu fit in this confined space? Considering that for most of the pairs listed the sidechain extend much further beyond Cgamma, this almost seems to suggest that Cd is pulling the two regions close to each other, causing at least some distortion. My fourth point is the unspoken assumption here that S3b (the region containing I325 and T326) are static. Fifth, stabilization of intermediate states (say C3/C2/C1) is almost always accompanied by, not just a shift in the Po-V curves, but also a reduction in the boltzmann slope. I am confused by the fact that in none of the traces shown Cd causing a change in the boltzmann slope (except of R362C). The splitting of the different pairs into groups is somehow as empirical as the rest of the paper is. In spite of crying about so many important details which have been eschewed by the paper, I can be silenced by one argument – “The model is the most parsimonious explanation of the volumes of data generated”, which indeed it is. (I am a bit biased against Cd bridge experiments having been burned by it on multiple occasions. Nonetheless I would’ve hoped for a candid mention, if not a careful consideration, of the hidden assumption in the paper). Since I have never performed ant Cd2+ bridging experiments myself, it is great to hear from someone who has. I agree with all of the points made by Sandipan and will briefly reply to them below. I agree that reporting the binding affinity is crucial and would allow us to better judge the bridging interactions between the proximal sites. I would have also liked to have seen more examples of the reversibility and was surprised that they didn’t show this in Fig.2B. Indeed you had to go into the supplementary (Fig.S1B) for an example of the reversibility (even that isn’t complete). I agree with your point concerning possible distortions of the structure by the Cd2+ bridging. This is something that the authors should have discussed further. Indeed there is good evidence that S3b does move during gating, at least in the KvAP channel see Ruta et al., 2005. I probably wouldn’t have noticed this but I see your point. They don’t as show all of the data so it is difficult to judge how much the Boltzmann is altered by the different mutant. It would be nice to see. I agree that this paper (and most papers) could benefit from a better discussion of the underlying assumptions. Also I agree that “The model is the most parsimonious explanation of the volumes of data generated”. It is great that they made these models since it allows for hypothesis generation and experiments to be designed to prove or disprove them. I will start a conclusions section in the above post to summarize the different interesting comments that are generated from the discussion. Thanks again for the contribution.